Buffalo snowstorm: 70 inches of snow as winter overpowers America. A weather station on the summit of Mauna Kea, Hawaii, dipped to 30 degrees Fahrenheit on Tuesday morning, and the temperature hit 32 in Chepachet, Rhode Island, as a continental-scale Arctic front approached—the last two of all 50 states to check in with freezing temps. This comes on the heels of some other weather mayhem across the United States, bringing us all four seasons in just one week. Fall: Though the Arctic blast may bring the peak foliage to an abrupt end, the urban East Coast had quite a show this weekend. Spring: A two-day tornado outbreak concluded on Monday with 11 reported tornadoes across five Southeastern states. The strongest of the bunch was an EF-2 with winds up to 130 mph that partially destroyed a Florida prison. It was also the longest-tracking tornado in the state of Florida since 2007, according to the National Weather Service in Tallahassee. Summer: Record-breaking heat hit South Florida on Monday, with West Palm Beach (whose records date back to 1894) reaching 89 degrees Fahrenheit. The heat index was 94 in Miami. But as the images below show, winter is undoubtedly winning. It’s nearly unheard of for a November day to get this cold. Tuesday featured the coldest November morning since 1976, with a whopping 85 percent of the territory of the lower 48 states below freezing. And for Buffalo, a city accustomed to heavy snows, Tuesday’s snowfall is bordering on the absurd. At an afternoon press conference, officials announced that New York Gov. Andrew Cuomo had called in the National Guard to help dig out the city. A wall of lake-effect snow—and yes, some thundersnow, too—loomed ominously just south of downtown for most of the day. The snows have a chance to be historic, not only for Buffalo, whose five-day snowfall record of 81.6 inches appears to be in jeopardy with another big storm on the way later this week, but for America, too. AccuWeather reports that at the storm’s current pace, a nationwide 24-hour snowfall record—76 inches in Silver Lake, Colorado, back in April 1921—could fall later today. In Orchard Park, New York, just a few miles south of Buffalo and in the heart of the lake-effect snow band, 3 feet of snow had already fallen by 9 a.m. Tuesday, according to the latest reports from the National Weather Service. An astounding 31 to 40 additional inches are expected later Tuesday. The Storm Prediction Center—a division of the National Weather Service better known for forecasting tornado outbreaks—is projecting snowfall rates of up to 4 inches an hour for most of this afternoon. TRAVEL WITHIN THE MOST INTENSE PORTION OF THIS BAND FROM SOUTH BUFFALO INTO THE NEARBY SOUTHERN AND EASTERN SUBURBS IS IMPOSSIBLE. LOCAL OFFICIALS REPORT ALL ROADS ARE IMPASSABLE AND CLOGGED WITH SNOW AND STUCK VEHICLES. DO NOT VENTURE OUT WITHIN THIS AREA. IF YOU LIVE NORTH OR SOUTH OF THE BAND OF SNOW DO NOT ATTEMPT TO DRIVE INTO THE AFFECTED AREAS…YOU WILL BECOME TRAPPED. As I wrote last week, the current weather pattern is practically ideal for particularly intense lake-effect snow bands on all five Great Lakes. Unbelievably, Buffalo will get another lake-effect band on Thursday that’s expected to bring up to 2 feet of additional snow, putting its all-time November snowfall record at risk in the span of a week. If you’re already sick of winter, don’t fret. 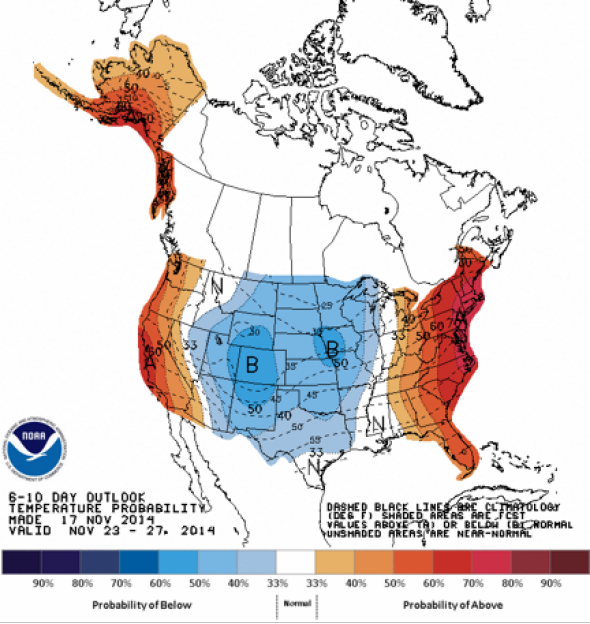 There’s a warm-up on tap for both coasts for at least a few days next week. After that? You guessed it: back to winter. The outlook for Thanksgiving week could be even worse.